A DISTINCTIVE blue and white sock found blood-soaked and burnt in Ian Phillip Hannaford's garbage bin allegedly belonged to missing Warwick grandmother Gail Lynch. Hannaford was yesterday committed to stand trial in the Brisbane Supreme Court, accused of the Warwick woman's murder. Hannaford, 59, had previously been in a relationship with Ms Lynch. 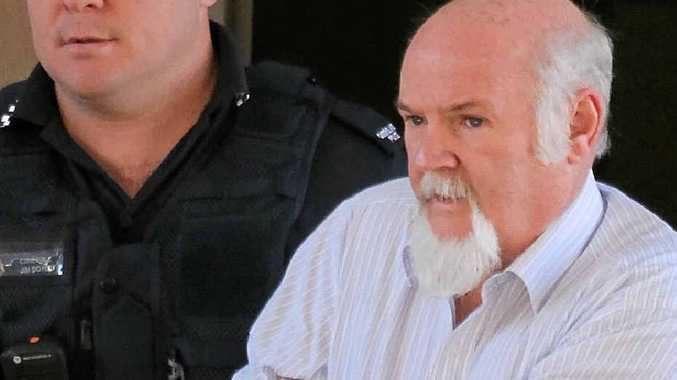 Warwick police Detective Senior Constable Ryan Harmer was called to the stand yesterday, during day two of the committal hearing, to be cross-examined by Hannaford's defence lawyer, David Shepherd. Det Snr Const Harmer was responsible for conducting the initial search of Hannaford's home in Gala Ct, Toowoomba, after Gail Lynch went missing on July 3, 2012. It was Det Snr Const Harmer who declared the home a crime scene on July 12, 2012, after discovering a blood-stained towel and blood in the bathroom sink. "When I found the blood I realised we were dealing with a lot more than a normal search," he said. "I left the bathroom immediately and phoned Detective Sergeant Darren Tamblyn to apply for a crime scene warrant." Det Snr Const Harmer was asked by the defence if he saw an axe in Hannaford's study. "Yes, I definitely saw an axe. I had no interest in the axe, at that time," he recalled. "I only looked quickly at it and remember thinking it looked new. In hindsight I should have taken a better look at it. "It wasn't until Det Sgt Tamblyn phoned me to say they had found a receipt for an axe and told me the date of purchase that I was interested in it." Defence lawyer Mr Shepherd asked why Det Snr Const Harmer continued the search outside the home. "I paid special attention to some freshly dug up soil in the backyard," Det Snr Const Harmer said. "I also found an empty packet of Ansell plastic gloves and the burnt, blood-covered items in one of the bins. "After looking at the type of gloves it made me think markings found on Hannaford's car window could have been caused by someone wearing the gloves." The defence asked if Det Snr Const Harmer thought that statement was an exaggeration. "No, the finger tips on the gloves could have very well made the marks on the rear car window." On July 13, 2012, Det Snr Const Harmer conducted a search of Ms Lynch's unit at 43 Guy St, Warwick. "I immediately had my attention drawn to a sock that looked identical to the one found amongst the burnt, blood-soaked clothing in the defendant's bin," he said. "They were not average socks; they were blue and had distinctive stripes." After the defence completed the cross-examination of Det Snr Const Harmer, Mr Shepherd gave his consent for Hannaford to be committed to trial. Magistrate Graham Lee formally accused Hannaford that on the day of July 3, 2012, he murdered Gail Lynch. Hannaford did not choose to give a plea. The body of Gail Lynch is yet to be found. No date has been set for Hannaford's trial.